Weaves' 'Walkaway' Is Bold Enough To Be Tender The newest song from the Toronto art rockers is surprisingly straightforward, an anthem to showcase Jasmyn Burke's voice, paired with a carefree, spontaneous video. Bruce Springsteen was born to run, but Weaves would rather walk away. "Walkaway," the newest song from the Toronto art rockers and the next single from their forthcoming album Wide Open, certainly channels the Boss in its anthemic spirit, but it remains loose and vulnerable in a way that is all Weaves' own. "Walkaway" is a more straightforward song than one might expect from Weaves; on its self-titled debut released last June, the band displayed a penchant for going down thrilling guitar-rabbit holes, such as on "Candy" and "Human." Morgan Waters' nimble guitar work does feature on "Walkaway," but the guitar lines and overall instrumentation — with Zach Bines on bass and Spencer Cole on drums — function more as structural support for singer Jasmyn Burke. Burke wrote "Walkaway" when she was "stuck in a moment of having to make a decision to stay or leave an unhealthy situation," she tells NPR. "On this album I wanted to be less afraid to use my voice." Here, Burke is brave enough to be tender. There are tiny, vocal moments of softness: the affectionate higher note of "girl" in the chorus; her wordless, melodic humming before the bridge; the wonderfully balanced line "the simple measures of pleasure keep the memories in." It all coalesces into a song that doesn't incite emotional upheaval in less than four minutes, but touches the heart in quieter, more unexpected ways. Similarly, the video for "Walkaway" is a simple but charming thing, directed by Waters and filmed on one of the first warm days of spring at a friend's farm two hours out of Toronto. 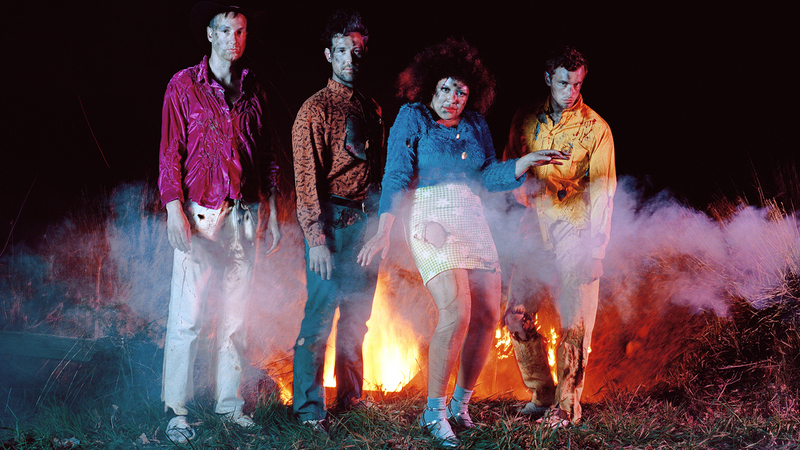 Weaves had initially only planned to shoot the cover for Wide Open, but the band ended up with a music video after a day spent "hanging out in the sun, drinking beer and grabbing shots here and there," Waters tells NPR. "Music videos can be so conceptual and stage-y, so it's nice to just shoot some stuff and see what happens." Before you meet the band as seen on the album cover — faces dirty, clothes singed, a little worse for wear — you see that carefree spontaneity in the video, whether it's Waters playing at being a cowboy on a rocking horse or Bines dancing at home like no one's watching. In the first act, Burke is both goofy and meditative, but by the end she's a little bloodied, directing her steely gaze straight into the camera lens, her face aglow from the bonfire. Wide Open comes out Oct. 6 via Buzz (Canada), Kanine (U.S.) and Memphis Industries (rest of the world). Pre-order here.